Madison Rabbit in "The Shadow With Sharp Claws"
Danny Meadow Mouse in "Reddy Fox Loses His Temper"
Old Granny Fox in "Reddy Fox Hears About Granny Fox"
Frisky Squirrel in "Farmer Green's Cat"
The KIDOONS Network presents Sea Serpent! 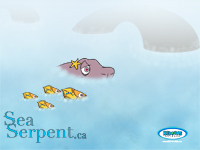 Meet the little fish's friends, the shark, the eel, the whale and the wise sea-cow as they discover a new species of fish or a very odd object which they call the Sea Serpent. 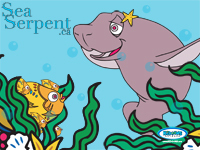 Read it now and join our friends in a great adventure under the sea as they try to find out how scary Sea Serpent really is!